Cut down on activities that bring you pain and avoid prolonged walking and standing to give your arches a rest. If you are overweight, try to lose weight. Putting too much weight on your arches may aggravate your symptoms. Your foot and ankle surgeon can provide you with custom orthotic devices for your shoes to give more support to the arches. In some cases, it may be necessary to use a walking cast or to completely avoid weight-bearing. Nonsteroidal anti-inflammatory drugs (NSAIDs), such as ibuprofen, help reduce pain and inflammation. Ultrasound therapy or other physical therapy modalities may be used to provide temporary relief. 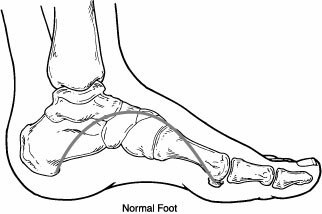 Wearing shoes that support the arches is important for anyone who has flatfoot.